Tom Crean's hissy-fit-like pseudo-handshake with Bo Ryan served as yet another reminder that he's a classless child who we could not be happier is not the coach of our team. It got me to thinking, though: how does Tommy stack up against the other coaches in the conference on the likability/hatability scale? Let's see. Coach Bo looks like a goblin and is goofy and over-the-top in his demonstrative, work-the-refs sideline demeanor. This sort of makes it easy to hate on ol' Bo. However, in postgame interviews and press conferences, he's a much quieter, softer-spoken man than you might expect. There's not much to suggest Bo does anything that skirts the rules -- he simply recruits big, goofy white kids who Wisconsonites love and teaches them to play winning, Big Ten basketball. Verdict: Hard to hate, also hard to like, though. Beilein always appears to be coaching hard, yet his sideline antics don't tend to rub us the wrong way. In fact, we wish Coach Painter was a little more fiery, so it would be hard for us to bash Beilein too much. Of course, it's Michigan basketball, which always winds up breaking some rules when they're good. Maybe B will reverse the trend. Verdict:: Likable, for a Michigan coach. Tubby has a surly side, but for the most part, you rarely hear anything negative about this guy outside of Lexington (and even then it's because he only won one title there). He's got that grandfatherly, kind old man appearance, but he also can coach some ball. Minnesota was perfect for him after Kentucky because the expectations aren't any more than compete now and then and make the tournament most of the time. 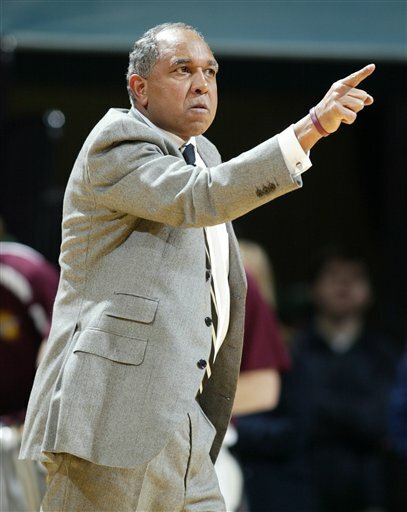 At a lot of schools, there would have been some serious coaching seat heat on Tubby over the past few seasons, but there hasn't been much flak out of Minneapolis, likely because everyone wisely realizes they're Minnesota and aren't getting a bigger name there than Tubby Smith. Tubby doesn't embarrass himself or his school on the sidelines and despite some leniency on thugs like Trevor Mbakwe, he seems to run a decent program. A phony, embarrassing, over-the-top doofus who is such a sore loser he can't even respectfully shake hands or conduct a radio show without being a surly prick, all the while quoting scripture on Twitter and somehow putting together top recruiting classes despite never having won a thing. He's a lousy game coach and has been exposed by Brad Stevens, Bo Ryan and almost Tubby Smith so far this season. There is truly nothing likable about this clown and in our opinion it's only as matter of time before it's revealed that he has crossed lines he shouldn't have. Matta isn't the kind of guy who acts out on the sidelines or comes off as a poor loser or obnoxious guy. That said, we have issues with him because of a "guilt by association" mentality. He's the coach at a school that is known to play ball, if you know what I'm saying and I think you do I'm talking about cheating. Wait, what? Matta, as noted, isn't an embarrassment to the conference in terms of his demeanor, but he's also not a real good coach. Why do I say that? Look at the talent that has gone through there and look how few actual title runs the Bucknuts have made. Izzo is a guy who we, like many of you, used to really like. We thought he represented the Big Ten well and was a stand up guy. But then more and more happened to chip away at St. Tom's image, at least in our eyes. There's no doubt he's an excellent coach -- his many Final Four banners back that up -- but Tom's judgement and clear willingness to look the other way when his thugs are acting like, well, thugs, is something we just cannot forgive. This article says John Groce is "everything Illinois could have hoped for." I guess they were hoping to continue Bruce Weber's recent legacy of mentally-soft teams who melted down in key spots. Harsh? Sure, but just look at the evidence. As for Groce, though, it's far too early to know if he's a hatable or likable guy. He did well at Ohio and was an assistant at OSU before that, as well as at Butler. So really, it's hard to figure this guy. Fran is a tough name to go through life with as a male, I would think. Coach Fran seems to us to be a decent enough guy and, again, as you can tell is often our barometer, he doesn't do anything that embarrasses his program or his players. Iowa is struggling to climb their way back to respectability and it has seemed for a few years as though they were close to breaking through. Maybe if they got really good Fran would take on some hatable characteristics, but as of now we have no real problems with him. What does it say about the basketball program at Northwestern that Carmody has now been there for going on 13 years and has yet to make a NCAA tournament? As most of you know, Northwestern has never made the NCAA tourney, which, if you're ever going to concern yourself with conference pride, this should bother you. Carmody was successful at Princeton in the '90s, taking the Tigers to the NCAA tournament twice, including winning a game in '98. Nothing jumps out at us in terms of him being an unlikable guy, other than the fact that he can't nudge the Mildcats to a tourney berth even once. Verdict: Likable as a harmless kitten. Miles has worked his way up the coaching ranks to get to his current Big Ten position and we can honestly say we hope he does well at Nebraska. Miles seems like a good guy and an easy person to root for. As with Groce, we haven't seen enough of him to have developed any ill will (and you all know how easy it is for us to do that), but maybe eventual success will change that. Chambers has a significant project ahead of him. PSU has never been a basketball hotbed, and that was only amplified when Ed DeChellis bolted to become the head coach at Navy -- actually choosing Navy over a Big Ten program. Could it be that DeChellis worried about job security? Possible. Or maybe he saw the writing on the wall after six seasons and felt building a winner in Nappy Valley would be nearly impossible. Regardless, Chambers has come in and tried to do his best. The Lions play hard but have struggled to find any success. Again, Chambers is new to the conference so we're undecided about him.